Research firm Strategy Analytics, in its “Global Mobile Workforce Forecast Update 2016-2022”, predicted that in the next four years 1.87 billion people will be mobile employees, comprising 42.5% of the total global workforce. North America and Western Europe already lead the way in terms of mobility. In Asia, with the rise of technology and a workforce that’s getting increasingly younger, employers here will soon see a larger number of mobile workers. CBRE’s inaugural “WORK_IT: Technology | Workplace | Jobs” survey found that staff in APAC expect better mobility in their future workplaces. In fact, 85% of respondents to the survey said they expected to see an increase in mobility in their future workplaces via formats such as activity-based workplaces or agile workplaces. And, 71% of Millennials expect and want an overseas assignment during their career according to PwC’s talent mobility 2020 report. The writing is on the wall where the success of an organisation will depend on its ability to manage its global talent effectively: designing mobile-ready spaces, offering global opportunities and implementing the right technology. HR leaders from Avery Dennison, Schneider Electric and Knorr-Bremse give their insights on what they believe the trends and challenges in mobility will be for companies to thrive in this mobile-ready future. The words “artificial intelligence” conjure images where humans are subservient to robots as they take over everything from airports to deliveries. However, the role of AI remains a tool for HR professionals to improve productivity so they can focus on people. In fact, in the latest survey by Korn Ferry, comprising nearly 800 talent acquisition professionals, 76% cite using artificial intelligence (AI) as a sourcing tool to generate higher quality candidates. Additionally, almost two-thirds (64%) of APAC respondents said AI had changed the way recruiting was done in their organisation. This trend is pervasive and extends to workforce mobility. “There is no doubt the external environment is becoming more complex and digital. Trends such as AI, machine learning and predictive models will strengthen and evolve; companies will continue their efforts to enhance the employee user experience through digital,” says Ying Cui, senior manager of the international mobility centre for APAC at Schneider Electric. While words such as AI and machine learning sometimes still seem ambiguous to how they might be implemented, when it comes to mobility they have a very practical use, explains Barbara Lam, regional manager of enterprise mobility for Asia Pacific at Avery Dennison. For example, relocation managers will usually go through the details of a new assignment, but with AI this could change. “Once you have all the information given to the AI or robot I’m sure the robot can tell you everything on your entitlements,” she says. While the potential of technology to shape a mobile workforce seems limitless, it does bring its own set of risks. The transfer of personal data across international borders is one of the most pressing issues for human resources to work on. It will be imperative for organisations to closely monitor the use of technology, balancing a fine line between employees privacy concerns, tracking movement for compliance and securing data, as the interception of personal and financial information is a greater risk when transferring across borders. Industry leaders Crown World Mobility’s white paper predicts that by 2020, 40% of American workers will be independent contractors. “The ‘gig’ worker – a temporary employee working on a short-term engagement – could also become a new way to define a full-time mobile employee assigned to gigs or short-term projects,” said the paper. Mobility may be increasing, but the nature of assignments are changing, says Avery Dennison’s Lam. “I think we will have more frequent business travellers or like a ‘local package’,” she says. She explains this means getting creative and offering an “inter-regional assignment” where companies offer basic and limited relocation support. This will also see companies sending employees on short frequent business trips instead of assignments, working a few days in numerous locations. Companies are also increasingly thinking of localisation she says. Once an expat is on assignment for a few years, companies will need to figure out if they can create a permanent local role for an assignee that sees them permanently relocate. But mobility isn’t just physical anymore. “Technology also enables us to collaborate and work together without having to move physically anymore, so employees can work truly internationally without having the constraints of actual relocation and travel,” says Schneider Electric’s Cui. The global competition for talent will only intensify as companies deal with a global ageing population and skills shortages for a rapidly changing future at the beset of technology. According to PwC’s report, the UN anticipates that China’s working-age population (those aged 15-59) will fall behind Vietnam’s in 2020 and lag behind India and Brazil in 2025. Ageing populations has numerous countries, including Germany and Australia, extending the retirement age so employees can work longer – and this provides opportunities for mobility. “These people are very experienced and can fill the talent gap,” says Knorr-Bremse’s Wong. On the flip side, Millennials come up as a key driver for mobility in the future. A more connected world means younger generations have a different idea on what a career should look like, and in order for companies to remain competitive and attract more talent, that means offering more mobility and opportunities for international travel. According to Envoy Global’s Workforce Mobility Survey 2017, 29% of employers offer secondments/overseas assignment opportunities. “Self-initiated moves are becoming a standard option; the Millennials’ desire for international adventure early-career is being supported as a means of recruiting and retaining talent,” says Lisa Johnson, of Crown World Mobility’s consulting group, in its mobility white paper. Asia’s inaugural Youth Mobility Index 2018 rankings found Singapore, Hong Kong, Taiwan, and South Korea, along with Japan, lead when it comes to youth mobility. As mobile working takes hold across Asia Pacific, companies will create office environments that improve staff satisfaction and comfort. The user experience will influence strategies, and technology will enable employees to customise their working location, allowing them greater flexibility in choosing, how, when and where to work. 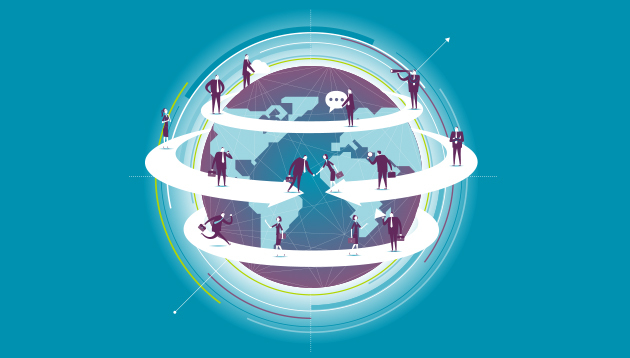 The landscape of global employee mobility continues to evolve. As new concepts emerge, topics that were once “cutting-edge” only a few years ago, are now popular trends.